D.J. Yates (RokuDan - 6th Degree) Sensei Yates has been training in karate basically all his life. He grew up hanging around the dojo and going to karate tournaments to watch his father Master Doug Yates compete. 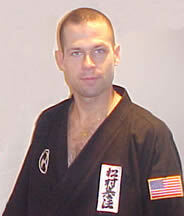 Sensei Yates current rank is RokuDan, 6th Degree Black Belt. He teaches both Kids and Adult Classes. As member of the United States Karate Team he has traveled to Ireland (3 times), England (2 times), Germany, Hungary, Dominican Republic, Argentina and Canada winning 9 Gold, 2 Silver and 1 Bronze Medal. He has competed all across the United States winning numerous National Titles and was awarded "ALL AMERICAN STATUS" from the United States Karate Federation. As a team member for TEAM USA, he received training at The United States Olympic Training Center. Sensei Yates is a Product Specialist with Germain Motor Company - Beavercreek.